On a base level, it’s a special über-hub for your bike that offers cyclists a ‘boost’ of power when needed and is powered through regenerative braking. 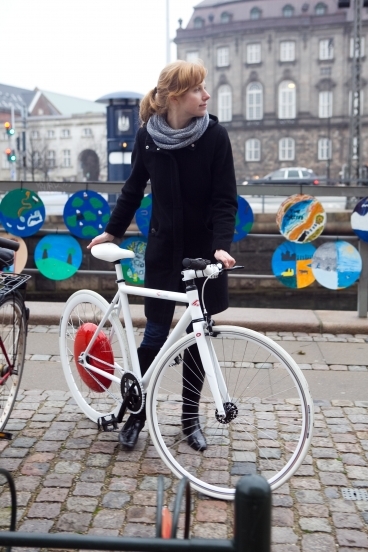 On a higher level, when connected to your iPhone (or other smartphone) it can track distance, power output, take pollution measurements, map your routes through GPS, tell you where your other Copenhagen Wheel equipped friends are and even act as a LoJack to a stolen bike. All sent to your smartphone via Bluetooth. In an ambitious effort to get 50% of Copenhagen residents to bike to work or school, the Copenhagen Wheel hopes to further the cause by not only extending the distance commuters can travel, but also smoothing out steep inclines so that neither are a barrier to cycling commuters. I’m unsure of whether or not the CW is also an internally geared hub, or whether the test bike modelled in the photos is just a single speed… Though the fact that it can be placed on any bike would hint that it has no gearing of it’s own. 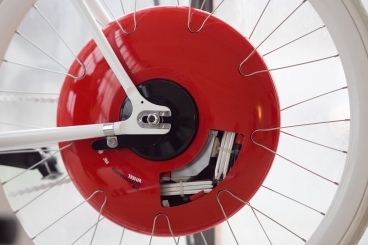 While I’m all for anything that gets people on bikes, and there’s no arguing that the Copenhagen Wheel is definitely cool, I have the same concern I have with advances like Shimano’s new Di2 electric shifting… While it may make for an arguably better cycling experience, the elegant simplicity of the bike is being slowly eroded.